To enable the transition to a hydrogen economy Auriga Energy Limited is creating reliable, renewable energy systems for the current and next generation of energy users. 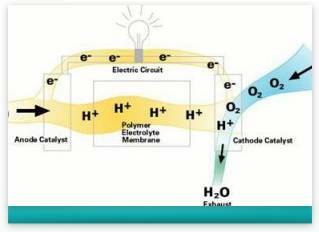 .. an electrochemical cell which captures the electrical energy of a chemical reaction between hydrogen and oxygen, in a reverse electrolysis, and converts it into electrical current, releasing water as exhaust. In simple terms, a fuel cell uses hydrogen and oxygen (from the air) to produce energy, with heat and water produced as by-products. The electrochemical cell captures the electrical energy of the chemical reaction between hydrogen and oxygen and converts it into electrical current. Fuel cells are combined to form a 'stack', in order to provide the levels of power output required for practical use. The team at Auriga Energy has developed fuel cell systems incorporating our control and power management units, combined with our engineering experience, to produce high-efficiency systems for a number of product families. With cheap and easily accessible oil coming to an end together with the realisation that gas supply will peak in just twenty years the need to find clean, alternative energy sources is becoming increasingly important. Generating electricity from hydrogen is a clean, highly efficient, electro-chemical process, producing no emissions or toxic waste.